Originally I had decided to visit Myanmar this year for our April/May familiarisation trip I changed my mind at the beginning of the year to visit Laos instead because we needed to inspect more hotels in Luang Prabang. That decision saved us from the terrible cyclone that hit the Delta area in Myanmar. 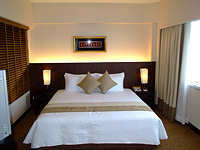 My business colleague, Rob, and I flew to Bangkok and checked in overnight at the super 5* Menam Riverside hotel. The plan was to get a local flight from Bangkok to Northern Thailand (Chiang Rai) next morning and cross over to Laos by boat at Houei Say. Arriving at Chiang Rai we drove about 2 hours to Chiang Khong and lunched at the lovely Nang Nual restaurant looking over the Mekong River. The crossing from Chiang Khong to Houei Say is only a few minutes by small taxi boat. Our guide in Laos, Khamsouk, had been waiting for us since nine o’clock in the morning (we arrived around 13:00). Before our boat reached the shore of Laos I saw an older guy running down to the landing and as our boat stopped he was helping to take our luggage from our boat. He waited for us patiently as we went through customs and visa procedures and then carried our two large bags all by himself up the slope to our waiting car. Our guide sent him away for a small fee but I called him back and willingly gave him an extra tip for all his hard work and patience. We began the long car journey from Chiang Khong to Luang Namtha. It took over 4 hours of driving through hilly mountain roads ans some dirt roads and local villages to reach our overnight accommodation at The Boat Landing in Luang Namtha. The Boat Landing is a simple and rural 'eco-lodge' set in a quiet location by the river. 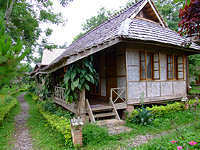 All rooms are built in wooden bungalow style with a sitting area in front looking out to the river and hills opposite. The 'green' theme is emphasized at The Boat Landing. 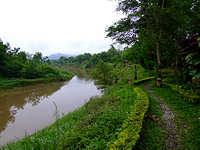 It has a very relaxing and quiet atmosphere in a beautiful and natural environment. The most amazing thing we saw was at night when darkness fell there were many little lights flashing continuously along the dark paths through the resort. When we stepped out of our room that night into complete darkness (the path lights only turn on automatically when you step down onto the path), we saw hundreds of flashing lights on the other side of the path. Rob’s first thought was that the resort had installed decorative LED lights. Not until we sat down in the restaurant did we see that 'LED lights' were actually fireflies. It is so charmingly beautiful and we had never seen it before. Next morning we visited the market in Namtha then drove on to Moung Sing. On the way we visited Tavan village for the Lanten tribe, Namngen village for the Hmong people and Namvuam village for the uplander people. 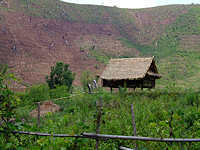 Each village has its own characteristic village houses and their own traditional colourful clothing. Arriving at Moung Sing we checked in at Phou Iu guesthouse. The Phou Iu is the best in town in this rural location. 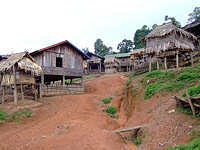 The charm of this town and Northern Laos in general is the non-commercialisation of the area. The main high street is full of local shops for domestic goods for the locals with just a few local restaurants and some guesthouses. All the visitors (there weren't many) mingled with the local people in their daily life. Next morning we decided to drive back to Namtha to do some trekking there instead of in Moung Sing. 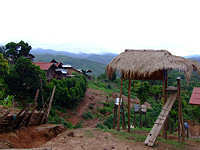 The reason was that we could cut back the long driving journey the following day from Moung Sing to Namtha to Oudomxay. Arriving back at The Boat Landing we met our trekking guide for the day. Due to the overnight heavy rains we were told the trekking would be difficult but we decided to do it anyway. The sky was still overcast by dark clouds and thin raindrops were felt in the air. Our guide took us a local shop on the main road to buy two colourful plastic raincoats. We were also given a packed lunch and water so off we went in our tuk-tuk up the mountain.